Here it is. A day in the life of Luke or more specifically, a day in the life of a special need’s caretaker – yours truly. Honestly, it’s kind of scary to put our life out there like this. It’s one thing to write the truth with the freedom of choosing words that paint the perception I want to offer, and it’s a whole other experience to actually show the truth – messy fingers, annoyance, and zero makeup. What if people don’t agree with how we’ve chosen to operate our lives with a special need’s child? What if they mock how we look? How I look?! Can I handle this? We shall see. Most of what you will witness can speak for itself but some of the footage portrayed needs an additional explanation. 1. 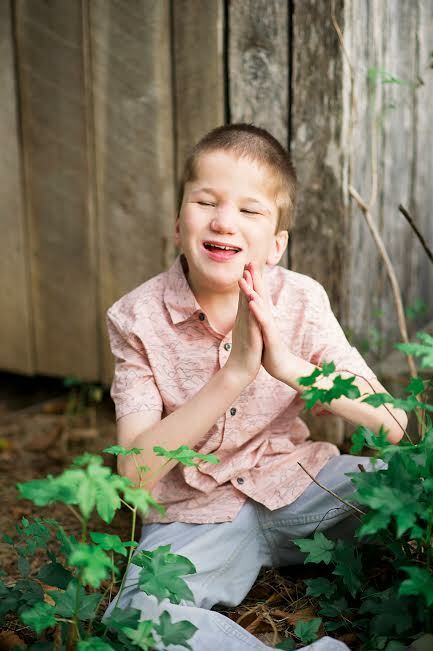 Luke’s official diagnosis is SXI – severe multiple impairments. Luke has a shunt because in theory he suffered a stroke in utero. Luke is extremely healthy. Luke continues to progress in every aspect of his life which is a blessing and a difficulty because he’s not very content most of the time. 2. You may notice a lack of sheets, pillows or blankets on his bed. This is a sensitivity issue for him. For some reason he only wants the big blue blanket. If we put sheets or pillows or additional blankets in his bed, he will rip them off and get rid of them asap. He usually wears a footie sleeper for warmth. 3. Luke’s wheelchair. Yes, Luke has a wheelchair. No, he’s usually not super excited about sitting in it. He won’t sit in it if we aren’t moving so putting him in his wheelchair to hang out with the family isn’t an option. If we were to attempt this, Luke would begin violently thrashing his body back and forth – the chair moving as well – while offering a high pitched awful sounding scream. This would continue until he either hurt himself or we removed him from the chair. 4. Luke rarely eats meals with us as you’ll notice in the video. His feeding chair doesn’t fit well in our smaller dining room and even if it did, we probably wouldn’t want Luke at the dinner table. Meal time is already intense with 8 kids. Luke was blessed with his mother’s long, thin, monkey arms. These arms are capable of reaching almost anything including all of the dinner plates and food. Luke also has a tendency to scream a lot – especially when hungry. So the grabbing and the screaming and the shuffling all of food out of the way, and the additional little voices lending to the grand cacophony of noise and chaos is just too much, and we made the decision, on behalf of our sanity, to feed Luke first followed by a bath, get him settled into his bed, and then eat dinner with the rest of the kids. This documentary is just a mom with an Ipad portraying her child with profound special needs so obviously not a recipe for the most professional work of art you’ll ever see. I apologize for any sound issues, all the “ummmms”, and use of “ok and so” about 500 times. I apparently lack an extensive speaking vocabulary. FYI – I am very open to a professional invading our life if there’s a film maker who would like to tackle this project and give it a more polished (or brand new!) look. In the meantime YOU dear blog reader can help spread the word by liking, sharing, and commenting on this post. By engaging in some small way, you are helping special needs caretakers raise awareness which will in turn (eventually) lend to more support and resources for our families. You can also follow along on Luke’s journey by finding him on Instagram at Life of Luke or the whole family at jessplusthemess on Instagram and Facebook. Finally, I am open to questions as long as they are respectful. The second anyone turns disrespectful towards me, my child, or anyone in my family, or come after me anonymously, I will cut you off. Period. I ain’t got no time for that. Enjoy and Just Keep Livin!